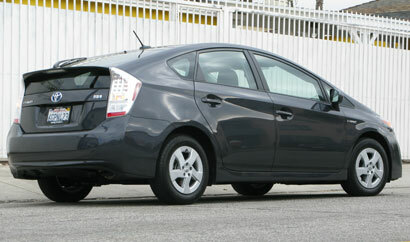 In short: An improved and amenity-laden hybrid hatchback. Now in its third-generation incarnation, the all-new 2010 Toyota Prius hybrid features a quieter, roomier and sleeker design while retaining its distinctive contours and fuel-efficient credentials. Yet with upstarts like the Ford Fusion Hybrid and Honda Insight, Toyota is not resting on its laurels—indeed, the Japan-based automaker reports that it filed for a thousand patents because of its efforts to improve the Prius. This solidly built and environmentally friendly five-door hatchback comes with a larger and more powerful 1.8-liter engine (replacing the 1.5-liter), ironically managing to improve the car’s fuel economy up to 51 mpg during city driving conditions, although we didn't get near that. Dedicated hypermilers can expect to exceed that rating. Regenerative braking, an 80-horsepower electric motor and a 650-volt NiMH battery pack guarantee the car’s gas-miserly manners, and four operating modes allow motorists the choice between fuel economy and performance. Ultra-modern to the core, this mid-size five-seater’s standard features include powered and heatable side mirrors; a driver-door Smart Key entry system with push button start; a rear spoiler; high solar energy absorbing glass; steering wheel-mounted audio and climate controls accessible via a Touch Tracer digital display; and a decent six-speaker single-CD audio system. 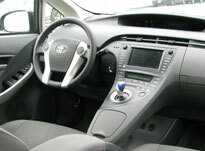 Depending on the trim—the 2010 Prius is offered in five levels—other features include a voice-activated touch-screen DVD navigation system; backup camera; and four-CD-changing, eight-speaker audio system with XM satellite radio, MP3/WMA playback capability, and hands-free phone capability via Bluetooth. Our tester came with the powered tilt-and-slide moonroof with a remote controlled air conditioning system; seventeen-inch wheels (over the stock fifteen-inch); leather-trimmed interior; heated front seats; pre-collision system; dynamic radar cruise control; lane-keeping assist and intelligent park assist are also available. You may not want to take the Prius on a road trip, (although you could adjust its engine configuration with energy generation) while braking is better suited for city activities, short commute and weekend errands. Nevertheless we appreciate this sustained evolution and so will you, as this automobile seems to retain a high resale value. Warranty/Service: 3-year/36,000-mile comprehensive warranty; 5-year/60,000-mile powertrain warranty; 5-year/unlimited-mile corrosion perforation warranty; 8-year/100,000-mile hybrid-related component coverage (15-year/150,000-mile hybrid-related component coverage in select states, with the exception of the hybrid battery, which is warranted for 10 years/150,000 miles).